Info "Grab the earth and use it to crush an alien invasion!" Global Warning is the boss microgame found in the Total Drag stage in WarioWare: Touched! The name is a pun on the term "global warming". The objective of the game is to drag the Earth through an obstacle course in space. First, pairs of watermelon-like planets fire several small ammo at Earth, which it must avoid. Some comets fly in after, and the player must then capture a stranded astronaut (which is being blocked by some giant asteroids) in the earth's gravity. This allows what appears to be the moon to orbit the Earth and shoot small beams. 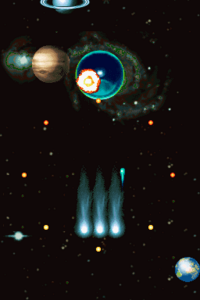 The player must use these to shoot down attacking planets (two of which resemble Jupiter and Saturn and orbit the larger, third planet), which shoot great quantities of ammo. Only shooting down the main enemy planet is necessary as its defeat takes down the other two planets as well. If the Earth gets hit once, the player loses. 1st level difficulty: The planets at the beginning shoot formations of ammo, and comet formations fly in. The astronaut is being blocked by two asteroids, which can easily be avoided, and they must shoot down the enemy planets, which fire a wave of three comets, deploy ships that can be shot or explode upon reaching the lower part of the screen, and fire a hexagonal wave of ammo acting as a larger shot respectively. If all three are active, they may perform a team attack and fire a few comets from the upper left side of the screen. 2nd level difficulty: Changes from Level 1 to this level include denser comets waves and enemy ammo, the astronaut being blocked by three asteroids instead of two, an extra planet that appears to be Mars along with the enemy planets that fire single shots as it orbits. A second team attack has also been added where they fire three waves of ammo in a fan shape along, with an upgrade to the first team attack where more comets are fired quicker. 3rd level difficulty: The comets and enemy ammo fly in very difficult-to-avoid formations, and the astronaut is being blocked by three difficult-to-avoid asteroid. Both team attacks have been upgraded and a third one has been added. Over 10 comets are rapidly fired in the first team attack and five waves of fan shaped ammo are fired in the second. The third involves launching four of the exploding ships that can be shot down before they reach the Earth. This page was last edited on July 17, 2018, at 23:15.